SCP-7800-J being tested by Researcher Boyd. 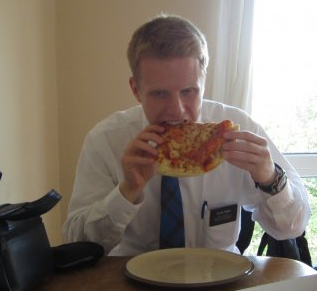 Note that his face has not melted off or anything. Special Containment Procedures: SCP-7800-J affected foodstuffs, too numerous to contain, have been partially held within Site-77's breakroom. No personnel have gotten sick or died because of SCP-7800-J affected foodstuffs. Description: SCP-7800-J is a phenomenon affecting foodstuffs which have been dropped onto the floor. For approximately five seconds, all possible contaminants will not affect it. This miraculous phenomenon has been observed by Researcher Boyd numerous times in the Site-77 staff break room. It is not actually all that unusual to perform in practice. When activated, personnel surrounding SCP-7800-J affected foodstuffs will react as if the researcher involved was eating from a trash receptacle, which he wasn't. Researchers are to note that there are more contaminants on a kitchen counter anyway. Extraordinary Event 7800-J-17, the Jim Pepperoni's Five-Cheese Calzone Incident, is estimated to have saved Foundation staff at least $5.95. This $5.95 allowed for the purchase of cinnamon raisin bagels, which further served to improve site morale. SCP-7800-J also served to protect site supplies from Anomaly 5XJ9 - 'Butter Side Down'. 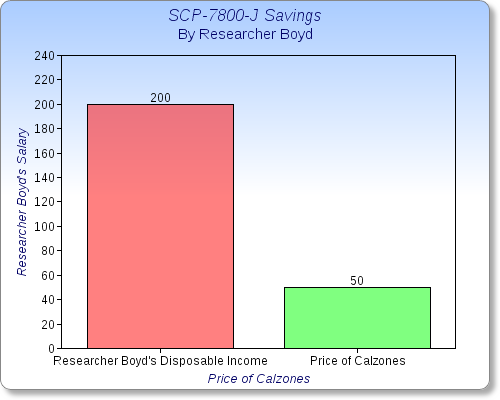 Addendum: Experimenters will admit that SCP-7800-J does not function properly when there are liquids involved, including sauces, but this has no bearing on Extraordinary Event 7800-J-17 because Researcher Boyd only took two bites and they were basically on the top. Incident Report: SCP-7800-J has been shown to affect dirty dishes as well - Researcher Darryl Jacobs was carrying large amounts of dishes after he consumed a single bowl of soup, and accidentally dropped them. Researcher Boyd manage to catch 9 of the plates, and then began to give them to Site-77's dog, Sparky, who successfully consumed the dropped foodstuffs without exploding or anything.